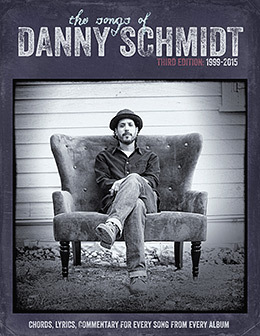 The 3rd Edition of Danny's songbook is available in paper and electronic formats. Includes every song from 1999-2015. Contains chords, lyrics, and notes for every song from every album that Danny has recorded from 1999-2015, broken down album by album. - Spiral Bound, so it lays flat. 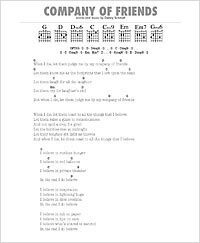 - Chord charts and notes to teach you the songs. - Commentary and stories to give some context to the songs to better understand them. Why would I want PDFs? There's a few handy things about getting the book in electronic format instead of the spiral bound paper version. First, it's cheaper cause there's no paper or printing costs. Second, you can order chapters of the book "a la carte," and get only the notes for the album(s) you're interested in. And third, you can put the files on your tablet computers and smart phones, and have them with you wherever you go. go get me some! Now with Indexes & Table Of Content? The electronic versions now have bookmarks for the Index and Table Of Contents. Just open up the sidebar on the PDF file, and select to show the Index or Table Of Content, and you can navigate easily to whichever song you want to jump to. PDF is the most common and ubiquitious format for reading files on electronic devices. As such, we've tried to make these files as universally accessible, as possible. They've worked on everything we've tried them on. But, let us know if you have a problem, and we'll figure out how to make it right. There's a number of great free readers available on every platform. Some of our favorites are: Apple's iBooks app, Google's eBook Reader, and Acrobat Reader. The files are DRM-free, and can be moved without limitation to any devices or computers that you want. The files themselves are high resolution, so you can zoom way in on even the highest-resolution devices, and the pages will still render beautifully. Because these are not graphically intense files, though, we've been able to compress them to a very small size, so they won't take up a lot of room on your device's drive. The chapters average about 2Mb's each, and the complete book comes in around 11Mb. So they're small files, but they look beautiful. go get me some! The "Add To Cart" links above will take you to Paypal's shopping cart system. As soon as you've completed your purchase, Paypal will send us a notice of your order, and we'll send you the appropriate links to download your files within 24 hours. Simple as that! go get me some!